Baraat in Indian wedding in considered as the most fun filled traditions in the entire humdrum. It is a processional ceremony where the groom along with his entire friends and relatives proceeds from the house towards the wedding venue in full merry making. 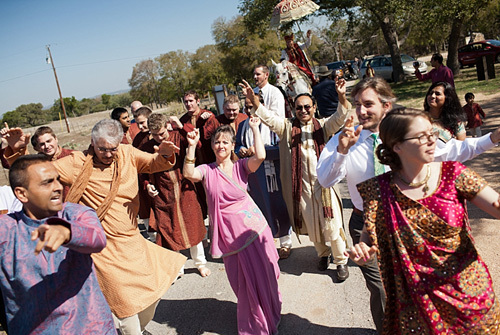 The dance in an Indian wedding procession is something unique and you won’t find elsewhere. 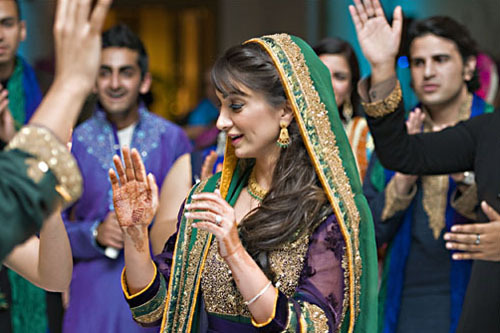 The songs played during baraat or the wedding procession has to be strictly high energy foot tapping numbers. This is because the whole procession is about full on energy. As the groom rides the horse, the friends and relatives dance all the way to the brides place. We have carefully chosen some of the best dance numbers from Bollywood specially dedicated to Baraat Entrance. Have fun with these Songs! Bollywood has a lot to inspire in Indian shaadis and no wedding is complete without the music that runs as a back drop of every ritual in the wedding. It is therefore, very important to land on the right kind of music for the right occasion. I recently attended a wedding and during Bridal Entrance when the bride was just about to enter, the over-active D.J. played this Punjabi song ‘Lak 28 kudi da, 47 weight kudi da’. Well, the moment which was supposed to be special, suddenly turned really funny and bizarre. Therefore to avoid such bummer, you should prepare a list of songs for all occasions before and give it to your DJ. To help you in the task, we have come up with the 5 best evergreen and must-have wedding songs for bridal entrance for you to choose from. Have a look! The list is just perfect to make you fall in love with every moment of a beautiful traditional Indian wedding. 1. Jashn-E-Bahaaraa (Jodha Akbar): Jashn-E-Bahaaraa is the all time favorite song for big Indian weddings. Because it is royal and romantic. Choose the instrumental version and let is act miracles on its own. 2. Din Shagna Da Aaya Ni Aao Sakhiyon (Dillagi): Don’t walk in to this song if you are already a bundle of nerves. It creates the perfect aura for the occasion. Though it is very common, but what is the harm? 3. Ye betiya toh babul ki raaniya hai (Na tum Jano na Hum): The songs describes the childhood of the girl. The music is simply enchanting. 4. Dulhe ka sehra suhana lagta hai (Dhadkan): The song is very uplifting. 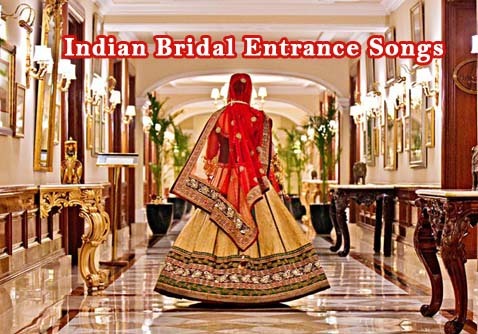 It has every element and sentiment required for bridal entrance attached to it. 5. Tere Bina (Guru): Go with this AR Rehman composition. The music is royal and romantic. Play the instrumental version. Saat phero ke saato vachan (Bhool na Jana): This song further spices up the moment. We would love to know which song was played at your wedding. Leave us the song below as we would love to add those to our list too.